Professor Vicki Garrett’s book chapter “Violence, Injury, and Disability in Recent Latin American Film” has been published inLibre acceso: Latin American Literature and Film through Disability Studies, edited by Susan Antebi and Beth E. Jörgensen (Albany, NY: SUNY Press. 2016). 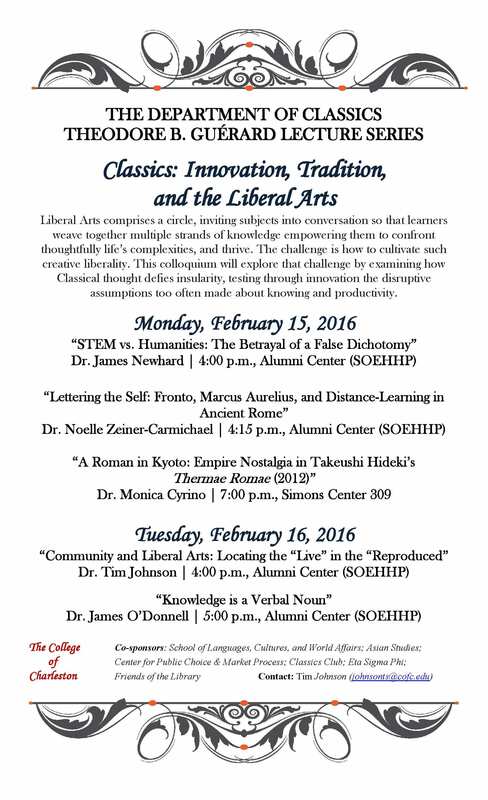 On February 15-16 the fifth annual colloquium of the Theodore B. Guérard Lecture Series will address the role Classics plays in the Liberal Arts Tradition and the innovative ways it continues to challenge our contemporary world. Professors Edward Chauca and Vicki Garrett’s article “Haunting Capitalism: Biutiful, the Specter, and Fantasies of the Global Market” has been published in Espectros: Ghostly Hauntings in Contemporary Transhispanic Narratives.